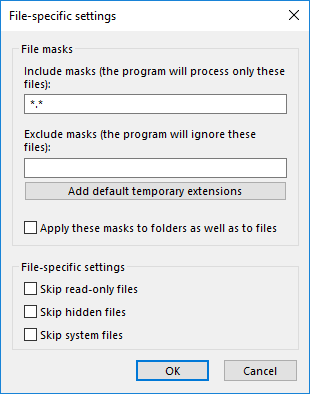 Handy Backup allows filtering data included into backup task through the use of file masks. You can back up only files of specific type (e.g. all Word documents in a folder), or on the contrary exclude certain files (e.g. backup everything except media). Since specifying backup set file-by-file appears to be a very long process which requires a lot of attention and accuracy, most people prefer backing up entire directories. However, if you choose to back up an entire folder with all contents, you will inevitably include many unnecessary files. A preset for automatic exclusion of unnecessary temporary files from the task. If you want to back up your video files, you may specify the video file extensions such as avi, wmv, mpeg, and Handy Backup will take care of them in no time. Backing up your entire music collection is a one-click job with Handy Backup. You specify the music file extensions such as wav, mp3, wmf, etc. and Handy Backup backs them up to any available storage medium such as CD, DVD, HD DVD, Blu-ray etc. Photos are precious memories that you would most definitely want to protect against loss and theft. With Handy Backup, you just need to specify the image file extensions such as jpeg, bmp, gif, etc., and the program will safeguard your entire photo collection easily and hassle free! Combined with scheduling and incremental backup, backup filtering allows creating the most flexible backup strategies that will meet needs of the majority of computer users. Handy Backup allows filtering data with masks in both file backup and file synchronization tasks. Download Handy Backup and save yourself up to 100 unnecessary clicks!